The Fig. 2.1 Vent Gas Scrubber System is a compact, light-weight and easy-to-install unit designed for economical and effective control of pollution from low volume sources. Vent Gas Scrubber System is comprised of a Fig. 2.2 Scrubber combined with Liquid Gas Separator. Both are available from stock. Use of the combined Fig. 2.1 Vent Gas Scrubber and Gas Separator is recommended where it is undesirable to send the entrained gas down the drain with the scrubbing liquid. No pressure drop is encountered when using this Liquid Gas Separator, therefore, no effect on scrubber capacity is seen. The Fig. 2.2 Liquid Gas Separator is a device to separate the entrained gas and liquid discharged from a Fig. 2.2 Vent Gas Scrubber. It operates on the gravity principle with the liquid directed to the bottom to run out a drain opening while the gas must make a 180 degree change of direction to exit through a top outlet. The unit is sized to allow low gas velocity so that gravity separation can be achieved. Compact, efficient scrubbing of small gas flows from lab hoods, storage tanks, and small industrial pilot plant equipment. Fig. 2.1 Vent Gas Scrubber Systems are economical in their use of water. They can provide a draft as fans can but they are also efficient in particulate and noxious gas removal - unlike fans. Unlike bag house-type filters, continuous operation is possible with minimal maintenance. The Fig. 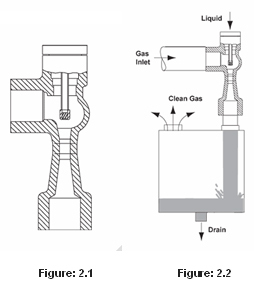 2.2 Liquid Gas Separator is used where it is undesirable to discharge the entrained gas with the liquid into a drain. Alternatively, if using a large tank with the Fig. 2.1 Vent Gas Scrubber, such as for recirculation of the scrubbing liquid, the Fig. 2.2 Liquid Gas Separator is not necessary. Typical applications include pollution from laboratory fume hoods, schools and industrial shops, pilot or bench scale plant equipment and smaller commercial and industrial uses.